Superiorly it has the jugular or suprasternal notch, and lateral to this are the clavicular notches. 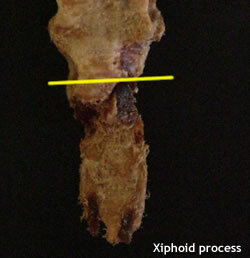 The inferior margin articulates with the body at manubrosternal joint- a secondary cartilaginous joint. Is thinner and narrower than the manubrium. 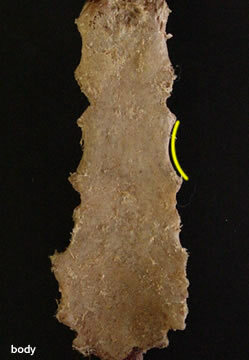 Anterior surface may have three transverse ridges. A thin, sword shaped process. Usually ossifies and unites with body of sternum around 40 th year.